I stumbled across this recipe from the Allrecipes site (www.Allrecipes.com) and then made a few modifications to the original, (as usual, I am tweaking again) to suit our tastes. I now make a batch of these weekly, much to the delight of hubby, who is totally spoiled and knows it. I vary the size and shape of the rolls to suit what I need them for, and they never last long either. 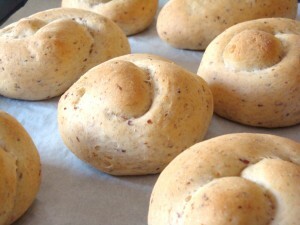 They are so soft, fluffy and just plain tasty…..who can resist the smell of fresh bread/rolls baking in the oven? These can be made by hand if you do not have a breadmaker, but the breadmaker most definitely makes the job that much easier. Place milk and butter in a 2 cup glass measuring cup, zap on high for one minute in the microwave. Stir to melt butter and then add the honey. Thoroughly mix honey into the milk/butter mixture. Add egg to the milk/honey/butter mixture and whisk slightly to incorporate. Pour these ingredients into the breadmaker first. In a medium sized bowl, combine flours, vital wheat gluten, ground flax and salt (if using) and whisk thoroughly. Add the flour mixture to the breadmaker; then add the yeast on top. Select “Dough” cycle on your machine and press ‘start’. After the dough cycle is complete, remove dough to a floured surface. Punch down dough and then cut into varying sizes of dough balls (2″ for small rolls, 3″ for larger rolls, etc.) I also like to roll out some into mini baguette sizes, whatever you like to do with them, go ahead and experiment! Place dough balls on a greased cookie sheet or parchment paper, let rise in a warm place until double in bulk. Bake in a 350F° oven for about 15 minutes or until golden brown. I dare you to just eat one….